The .32 North American Arms (.32 NAA) pistol cartridge was developed in 2002 through a joint project between noted small pistol maker North American Arms and Corbon ammunition. The .32 NAA was designed to improve upon the performance of its parent case, the .380 ACP, as well as the .32 ACP it was intended to replace. 32 NAA ammo features a rimless bottlenecked case which enables it to feed into the chamber more smoothly and reliably than other common straight walled cases in small framed automatic pistols. At the same time, this bottlenecked case allows for greater powder capacity, focused behind a smaller projectile, resulting in increased pressure and velocity. These increased pressures cause more muzzle noise and flash than a .380 ACP, but the felt recoil is virtually identical. 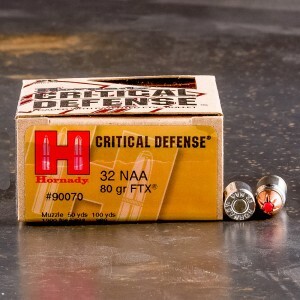 Projectiles for the .32 NAA range from 60 to 80 grains in weight, and as the cartridge is designed for compact, defensive pistol use, both full metal jacketed rounds and jacketed hollow point rounds are available for practice and defense respectively. Lighter bullets can achieve higher velocities than the .32 ACP - 1,222 feet per second vs 1,100 feet per second - from a shorter barrel, increasing kinetic energy by more than 20 percent, creating a flatter trajectory with greater range. Thanks to its bottlenecked case and higher powder to bullet weight ratio, the .32 NAA bridges the gap between .380 ACP and .32 ACP, offering more reliable feeding without sacrificing terminal performance, making it a viable caliber for ultra-compact defensive carry. Great ammo. Shooting it from my Diamondback DB380/.32NAA. Chrony'd at 980 - 1000 fps. Very decent for a small pocket gun.